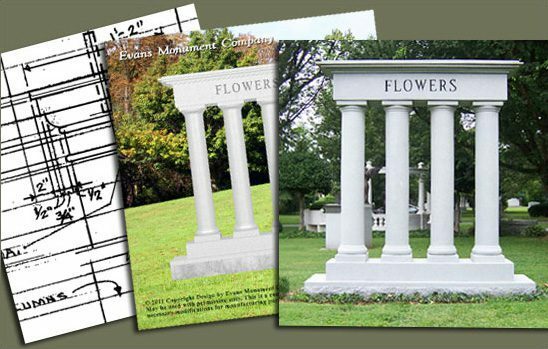 Designing a custom monument is an art form – something that should be taken seriously by anyone interested in an attractive and expressive monument. It is vital for a good designer to have the skills that can only come from training and experience. At Evans Monument Company, the design and building of custom headstones and granite monuments is our life work in which we take immense pride. We do nothing else. We work with multiple mediums, using both traditional forms of artistry (hand drawings) to the modern tool (computers) to draft, design, and bring to life what once was a simple block of granite. Our proprietary software allows our families to take part in the design process at our location, watching and making changes as the monument design comes to life. A well crafted monument truly reflects the spirit and personality of the one for whom it was made. It is only the skilled designer that can create a beautiful monument that has a personality of its own – a custom monument design that truly reflects something of the spirit of the person for whom it was made. Monuments that are well proportioned, expressive, interesting and pleasing to the eye do not occur by chance. They are not products of a cemetery plot sales person selling monuments part-time. They are not copies of a monument built for another family or simply pulled from a book. They are created specifically for a family by a skilled and experienced monument designer.